Fitness and wellness are both important aspects to include your life. Being able to ensure that you are staying healthy without any additional stress always makes it a bit easier! As a resident of South Florida, it can get pretty hot outside making consistent outdoor workouts a little tough. However, the heat does make for the perfect time to take a dip in your swimming pool and combine some activity as well. 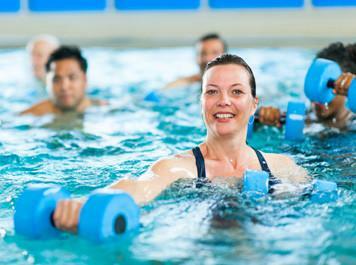 For those that own a swimming pool, swimming is a great form of exercise for people at any age. It is low-impact, easy for people to do and especially good for your cardiovascular system. It is recommended for adults to get around 30 minutes of aerobic activity daily and swimming is one great and simple way to do so. When you swim, your heart will beat faster, which will deliver more oxygen to various parts of your body. The vigorous beating will strengthen your heart, which means that it will not need to beat as quickly, and it will be more efficient. Regular exercise, such as swimming, can reduce your risk of developing heart disease, can prevent a heart attack and may lower your blood pressure. For those younger swimming, swimming is a great way to maintain great health or release some energy while relieving stress. When it comes to those products that assist with swimming as it related to exercise, our favorite has to be adding a little extra resistance with various weights designed to use in the pool. Also, water dumbbells and barbells are great options! All of these products are not necessary, but will really amplify your already amazing pool workout! Swimming gives you a total body work out, so what are you waiting for; jump on in!